Sona Jobarteh is an exciting new talent from the West African Griot tradition who is on a roll in 2018 with more than 40 performances around the World, including her first US Tour. The Kora, a 21 stringed African harp, is traditionally played by male griots, or hereditary musicians, and never by women. 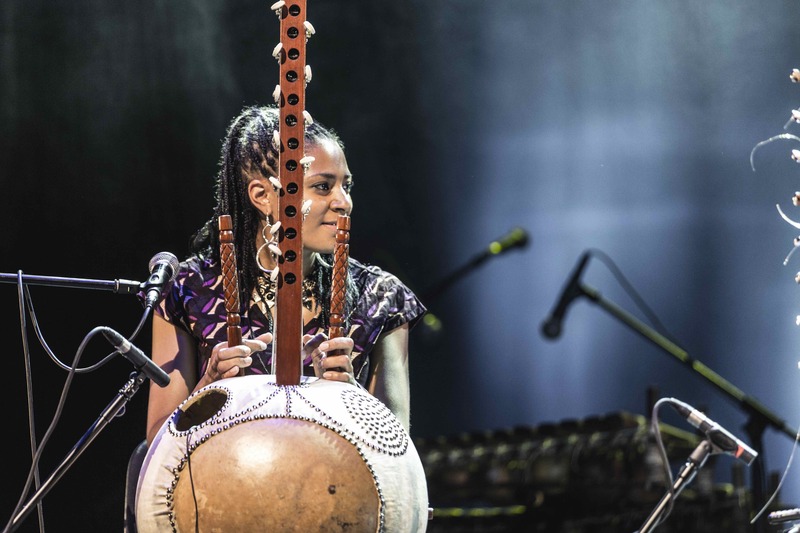 Sona Jobarteh has broken this tradition by becoming the first female Kora virtuoso to come from a prestigious West African Griot family. She stands as she plays, demonstrating elegant and intricate musicianship; she is also a fine singer, with a cool, laid-back style, who fronts her own band who she will be touring the UK with from 7-19 June. The band features Sona on vocals, kora and guitar, Mamadou Sarr percussion, Andi Mclean bass, Westley Joseph drums and Derek Johnson guitar. 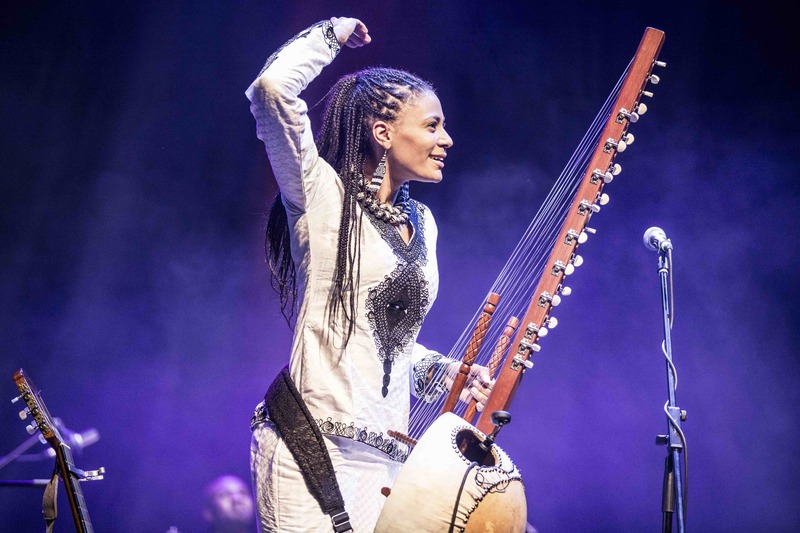 Sona was born into one of the five principal West African Griot families, which carries a heavy reputation for renowned Kora masters, notably her grandfather, Amadu Bansang Jobarteh who was an icon in Gambia’s cultural and musical history, and her cousin Toumani Diabaté who is known worldwide for his mastery of the Kora. Taught to play at the age of four by her elder brother Tunde Jegede, Sona started her musical journey at a very young age, going on to study at the Royal College of Music and Purcell School of music, as well as being a permanent member of her brother’s Ensemble. 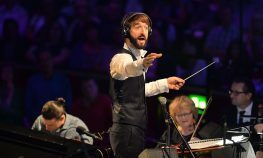 During her career she has worked alongside many internationally acclaimed artists including Oumou Sangaré, Toumani Diabaté, Kasse Mady Diabaté and The BBC Symphony Orchestra. She has won over audiences all over the World with her captivating voice and catchy melodies bringing messages about the issues that she champions – cultural identity, gender, love and respect, whilst remaining utterly faithful to her Gambian heritage. Her exciting stage presence, however, reveals a wider “raison d’etre”. Sona stands tall in the fight for Women’s rights making it her calling to speak directly to the women in all her audiences and she staunchly upholds her Gambian homeland. She has singlehandedly built up and financed a school for Gambian children from zero, to preserve her Griot heritage for later generations. She has trained and hired all the staff and brought in European Governmental funding to allow a new purpose built school building to appear. Her wholehearted support of Women’s issues – including FGM – and The Gambia is not just spoken about, she acts upon it, being busy as The Gambia’s representative within The World Trade Organisation and also the World Bank. Sona Jobarteh is a truly extraordinary woman in both her musical and humanitarian work.